Let me start of with telling you why I started a daunting task like this. 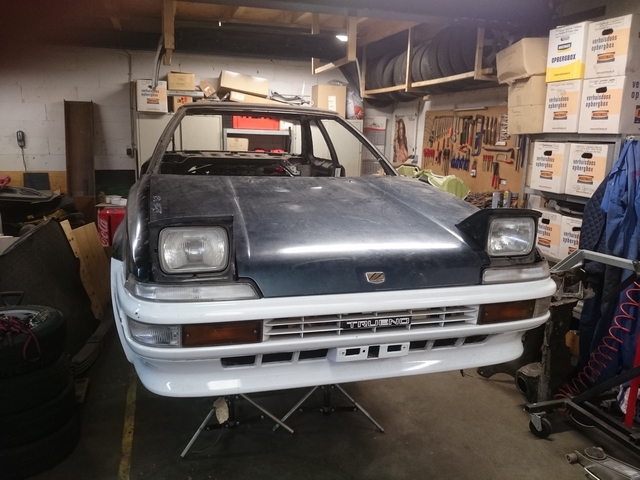 By some shear luck, I found a bonnet and a set of pop-up headlights off a Japanese Sprinter Trueno on a local E-bay like website. I would never thought that I would find parts like that in my own country. But since I was one of the very few interested, I was able to pick them up at a very nice price. And after a long drive to the other side of the country I got myself some nice new panels. And since I was still missing a pop-up headlight motor, and these new headlights still had them attached, it solved that problem for me as well. 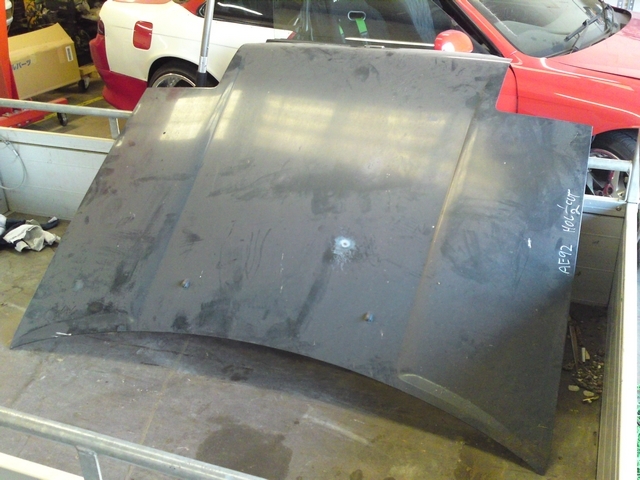 And when you just drove a long way for some new panels, you just want to fit it to the car and see what it looks like. 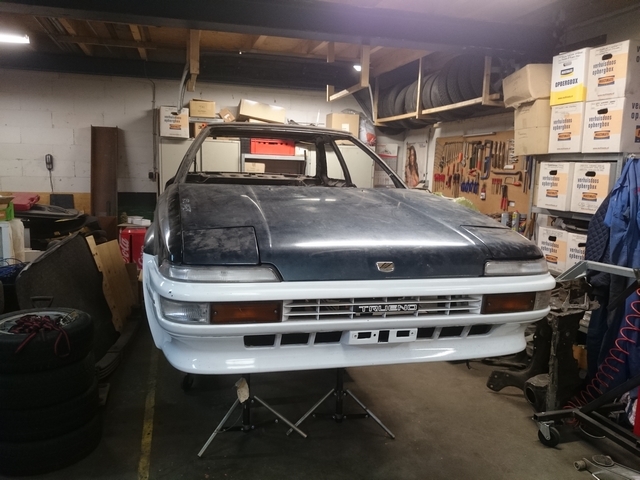 So I spend a evening in my workshop, bolting down the new hood and headlights I just picked up together with both doors, front fenders and the new Trueno Zenki front bumper. But no matter how I tried, I couldn't get the panels to line up right. I ended up with large gaps or the panels were right up to each other. There had to be a reason for that to happen, so I started to take a better look at my parts. Some of the issues I ran into. In the left picture, the panels were right up on each other. In the picture on the right there are some large gaps. Now that I had some material to compare them to, I quickly identified the problem. Someone had been messing around with the mounting points of several parts. The new headlights I bought were flawless, but now it became clear to me that in order to make the old headlights fit, they modified the mounting tabs to get them to work. One of the messed up parts. 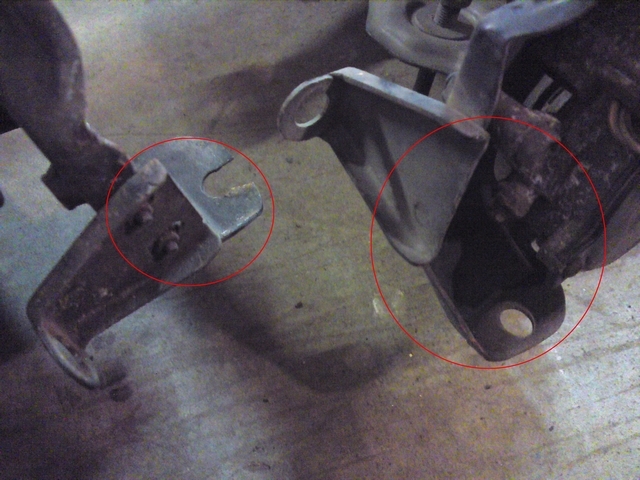 On the left, the mounting tabs of a headlight that came from the car. 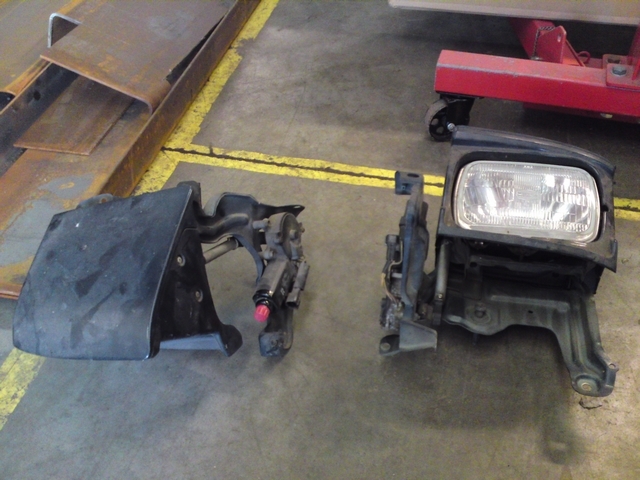 On the right one of the new headlights with the mounting tab as Toyota intended it to be. There can only be one reason to mess about with several parts like that: The chassis it is all bolted to is flawed. So I would have to look into that first. I now had a 'repair manual for collision damage' in my possession which lists all the dimensions for the body of the car. The coupé model is also included in this manual, so I could find out what the problem was. 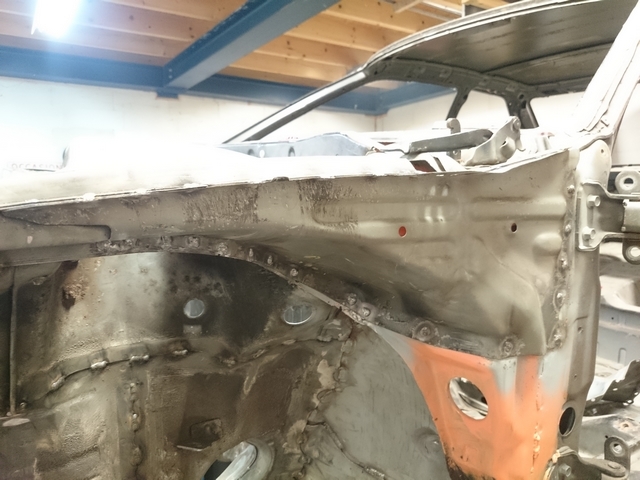 With this new knowledge, I started to take a closer look at the body of the car. Parts of which I thought were mere pieces of paint that were letting go turned out to be something much worse. 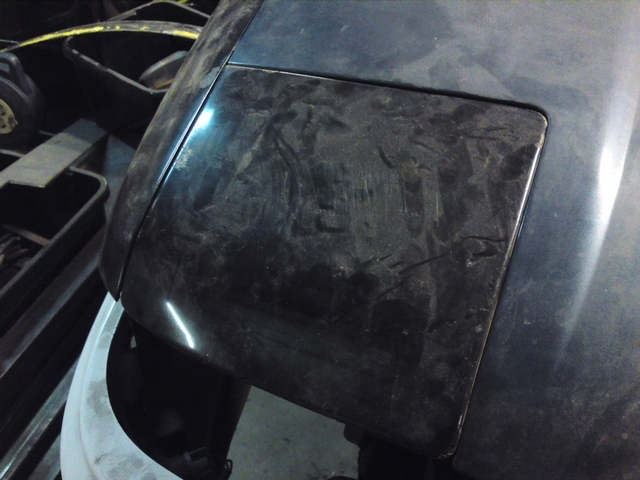 When peeling them back and cleaning those area's up with a wirebrush on the axle grinder, there were signs of some serious damage to the front of the car in the past. Small hints to the extend of the damage. Now, had did I not see that before you might ask? Well, someone did a professional job of trying to repair the damage. 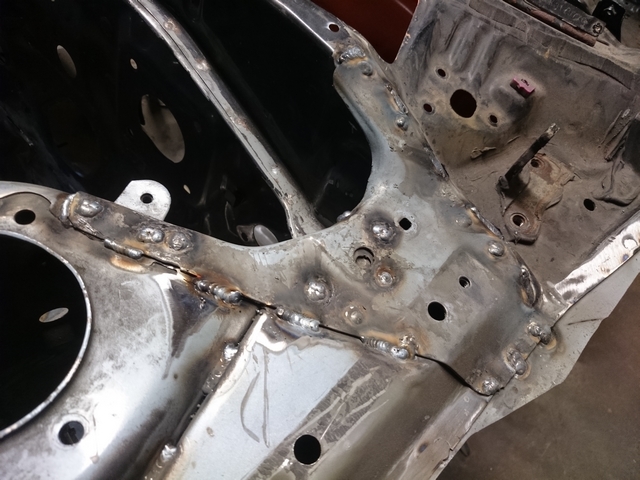 They tried to straighten the chassis out on a straightening jig, welded in a new front cross member and used filler to make most of the damage invisible. 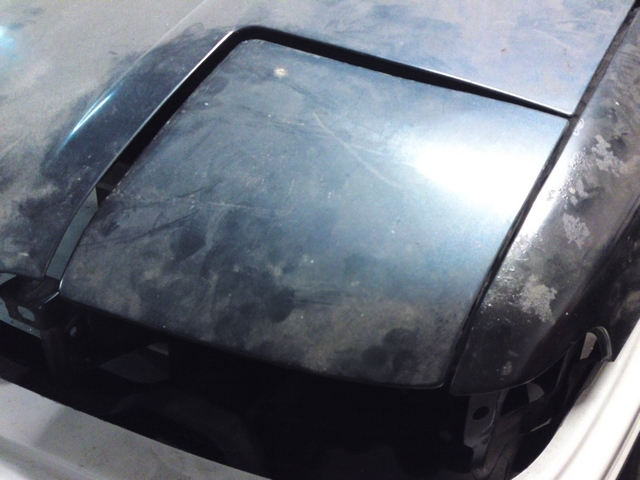 After a paint job, it was hard to see the extend of the damage. Now that it was all revealed, there were some creases visible in the body panels that Toyota certainly didn't put there. 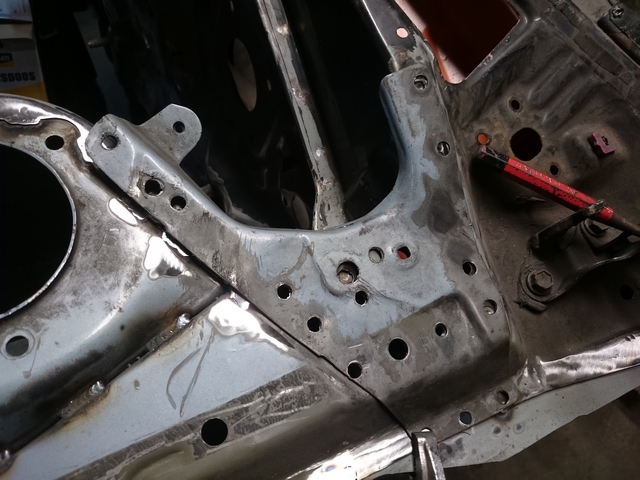 To make the other parts fit to the chassis they simply slotted the mounting tabs or altered them to make it all fit to the chassis. But although it must have been quite a job to get it all done, it just wasn't enough to get it all back to normal. 1. Accept that this chassis wasn't going to work and bin it. Not really an option as I couldn't get a replacement. 2. Try to do what the last guy did: modify the parts to fit the chassis. 3. 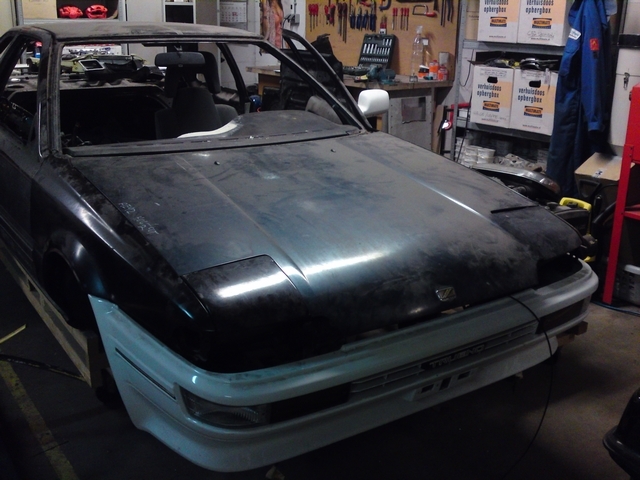 Or do the only right thing in my mind: Try to get the chassis back up to standard. Of course I went with option 3. But to get the car back up to standard, I would have to think big on this one. I only had one option really: Replace the entire damaged front with a undamaged donor front. This wasn't just going to be a quick fis or even a repair. This was going to be a project all in itself! A very daunting task indeed. Quite a few people would have binned the chassis and might have given up. But I was convinced that I could get it done and besides, I was kind of looking forward to such a challenge! 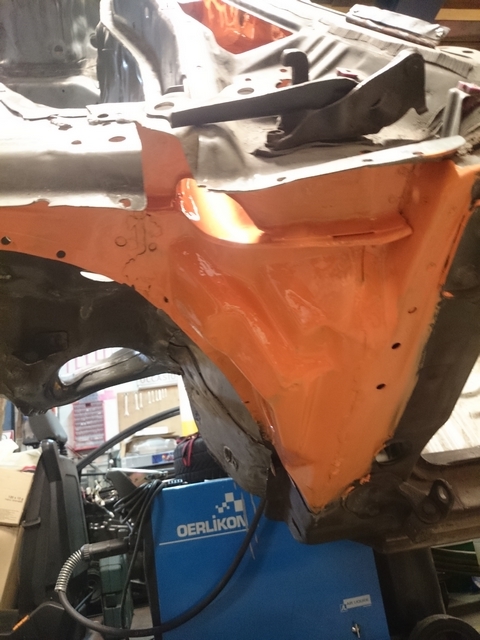 After looking at the construction of the car and the extend of the damage, I concluded that it would be easiest to separate the front from the rest of the car at the firewall. Now I could start my search for a decent donorfront. 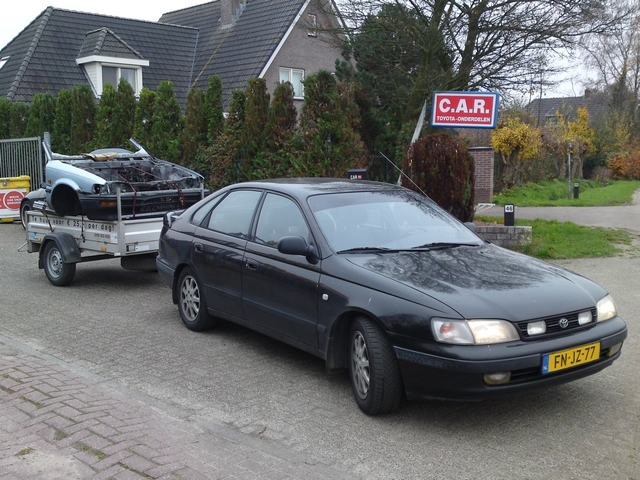 As said before, this coupé model was never sold here in The Netherlands so getting a front of a coupé would be impossible. But luckily for me, up to the firewall, the chassis for al E9 models is exactly the same. But since the Corolla E9 has gone pretty much extinct in this country I was already fearing that it would be very difficult to find a undamaged front end. 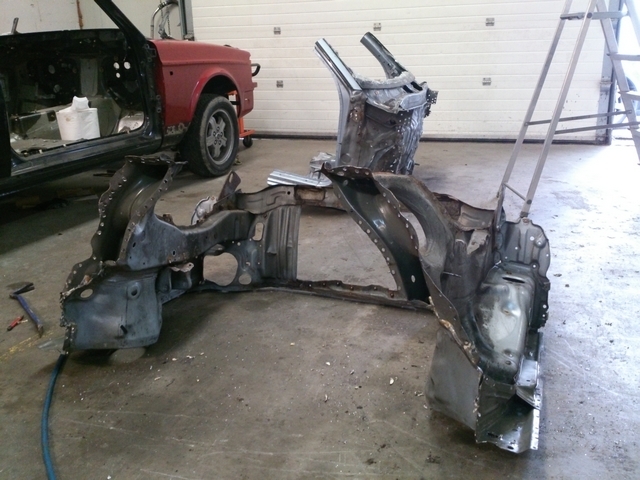 But after making a few calls, I found a Toyota specialized scrapyard that could supply me with a undamaged E9 front end. They had a Corolla EE90 (1.3 hatchback) in their yard which was structurally sound and they could chop the front end off it. I was hoping for a AE92 chassis, but since my options were very slim, I couldn't be picky. 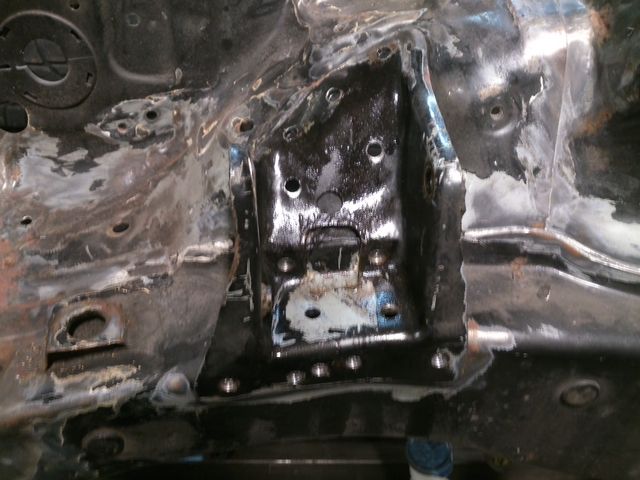 And besides, after all of this, relocating a few engine mounts (the only difference between the EE90 and AE92 chassis) shouldn't be that much of a problem. The guys over at CAR Toyota Parts were kind enough to chop the front of a Corolla E9 hatchback so I could take it home with me for a very decent price. And they had been right, the front was as straight as an arrow and looked as if it was in pretty good condition. This lump of metal was probably going to save my project. As can be seen in the pictures above. 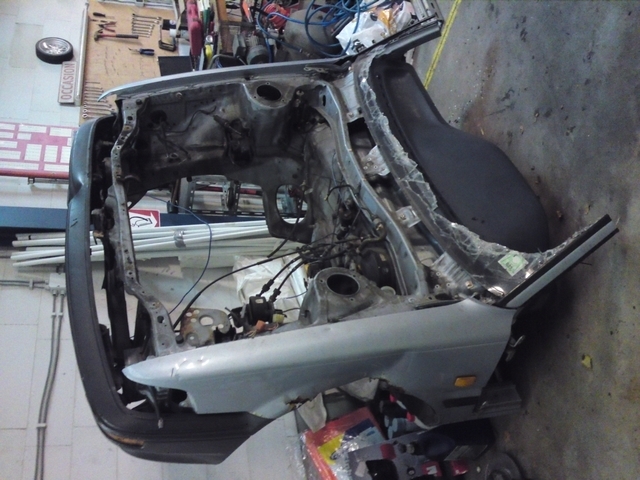 There were still quite a lot of parts attached to the chassis that I wasn't going to need like an entire dashboard with instruments, bumper, fenders and various small parts. I will have to take those off before I can really get cracking. But it's always nice to have spare parts. 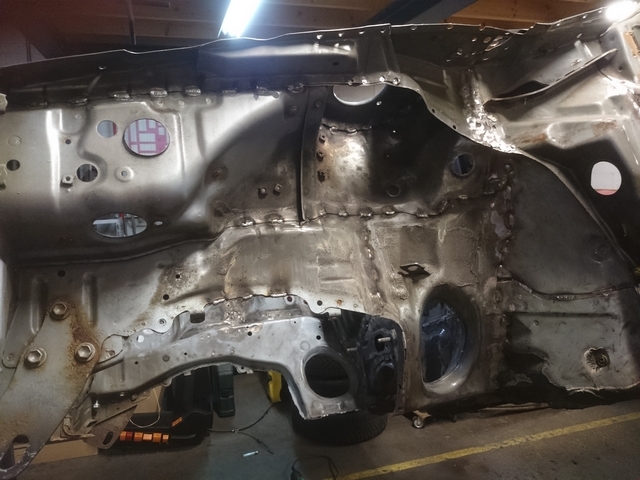 When the donor front was stripped of all the unnecessary parts, I could start taking off all the sealant from the panel seams again and start the tedious process of drilling out every single spot-weld holding the front on to the firewall. 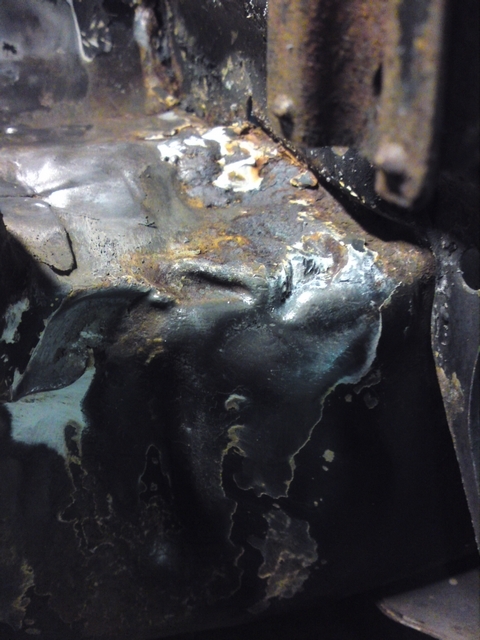 There are several tools to remove spot-welds. 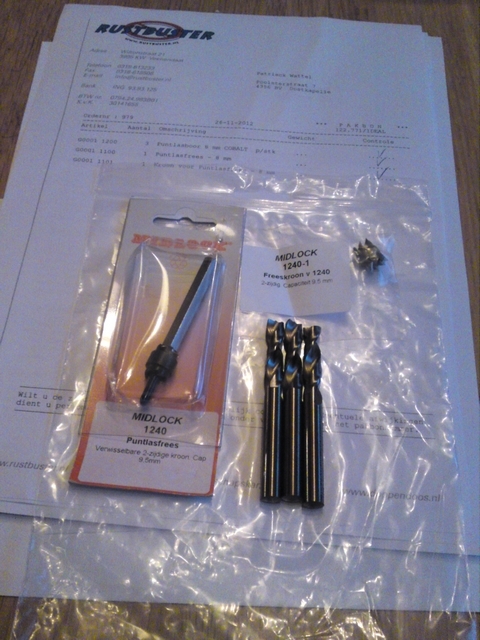 There is the milling tool and the special, spot-weld cobalt drills. I've read different stories from people who have used them and it's just a matter of what people prefer to use. I haven't used any of them yet so I just bought them both to see what would work best for me. The idea behind the mill is that you cut into the softer material around the weld. Because a weld is heated, the material hardens and thus by avoiding this hardened steel, this should be easier and less prone to wear. There is a centering pin in the middle of the mill that retracts into the stem of the mill. With a diameter of 9,5mm's they're a tad larger than the average spot-weld. The spot-weld drills have a diameter of 8mm and are made of cobalt and specially heat treated to harden them even more. They have a flat head with two very sharp cutting edges and a center point to prevent them from wobbling about. I tried both and I quickly found out that I prefer working with the spot-weld drills. The result of using both methods. On the left I tried the mill and the welds on the right were drilled. As can been seen in the picture above, I found working with the mill very messy. Despite the centering pin, the sharp mill tended to chew into the metal and it was very difficult to keep it centered. The drills were much easier to use. Only thing you have to look out for is that you don't drill all the way through. I used special drilling and cutting fluid to keep wear on the drills as low as possible. But I could get cracking now with removing all the welds. 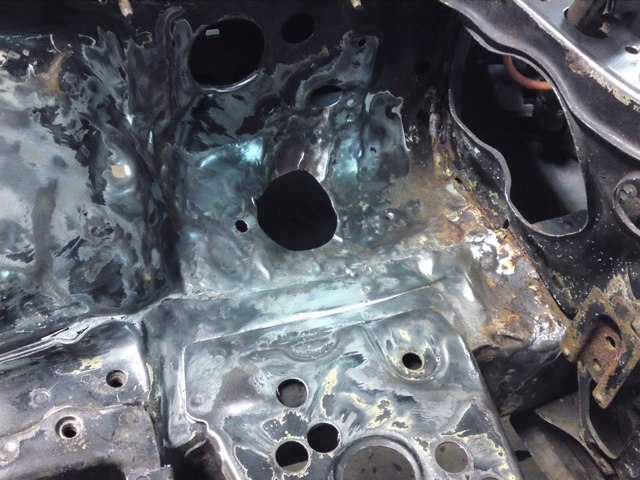 And to get to all the welds, you sometimes have to remove complete panels to be able to remove all the underlying welds. 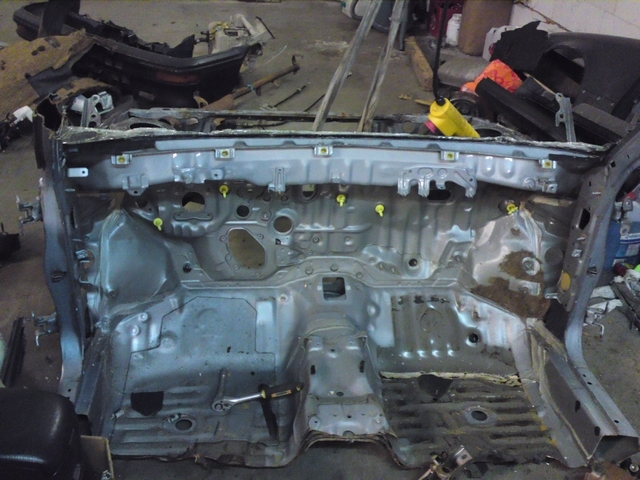 Those panels can be welded back in place later on. 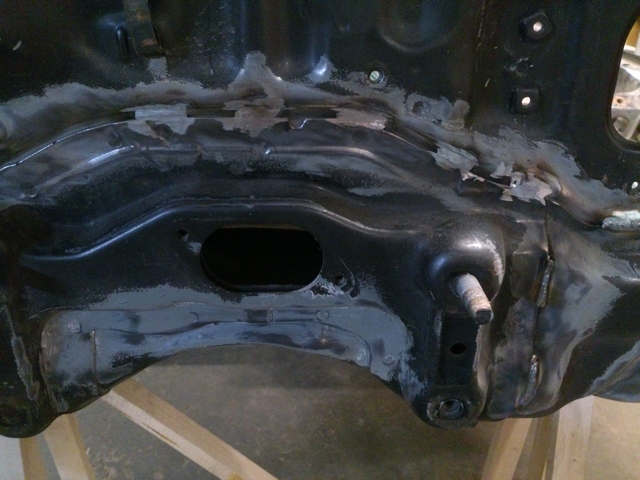 When all the spot-welds were removed (I make it sound easy here, but it has been a very long, boring and tedious process). I could start to try and get the firewall separated from the rest of the front. I used two slings in the most solid points of the front to try and lift it off. After some wiggling with a chisel, screwdrivers and crowbar, the last pieces of welds finally gave way and popped free. 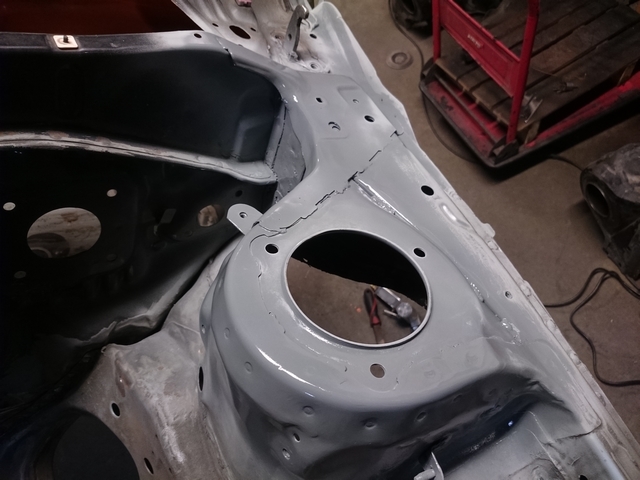 To add a little rigidity to the donor front and prevent it from bending or something like that, I bolted the subframe and strut tower brace to it. Because it will have to wait a little before I get around to it again. I'll have to drill out the spot-welds etc. on the car itself this time. I do however now know where all the spot-welds are located and how the thing is put together. So let's do it all over again! 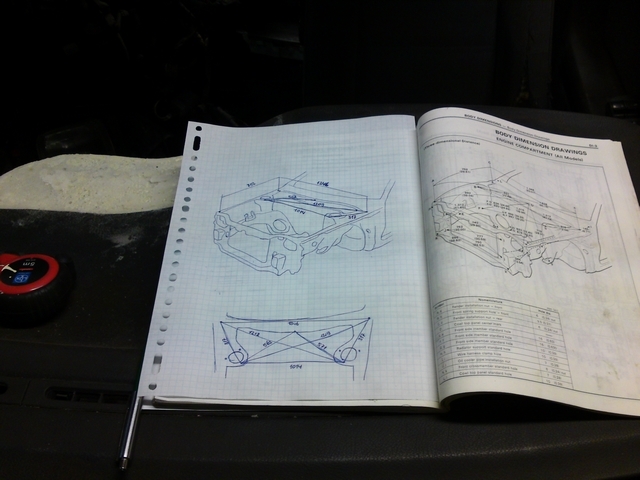 With the front of the car, I started with removing the engine mount for the 4A engine. 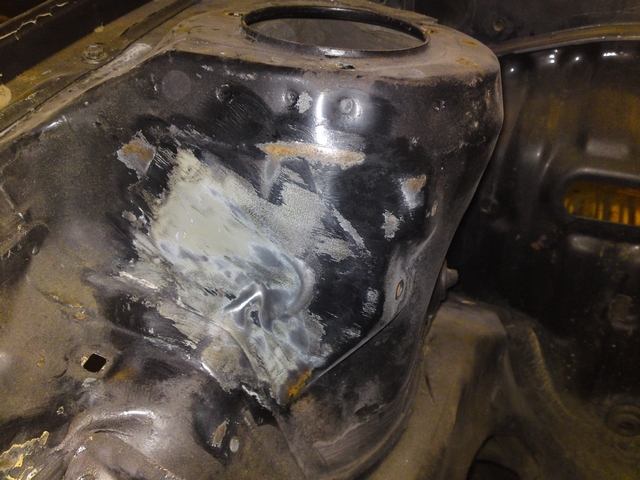 This will have to be welded into the donor front in time to replace the 2E-E mount that was in there. 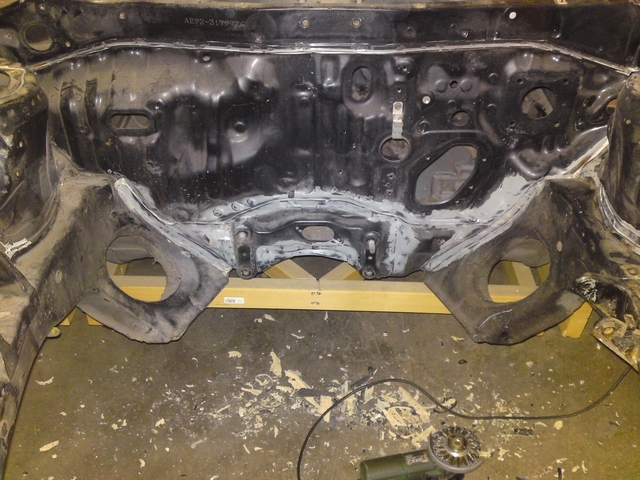 The engine mount of the 4A engine drilled out and test fitted where it will sit in the donor front. 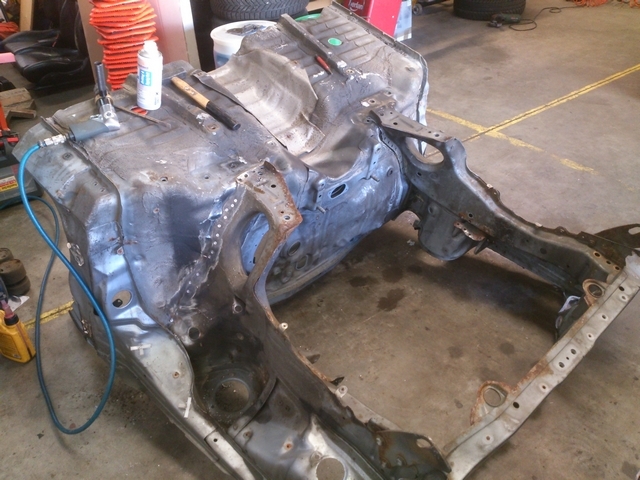 Then I removed the panels that had to come off first to get to welds underneath. A little lesson I learned earlier. 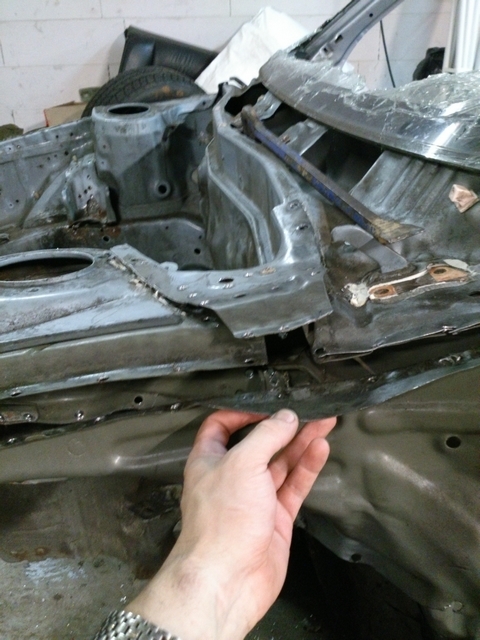 And then I went back to the tedious job or drilling out every single spot-weld on the front of the car. The rotisserie now really proved it's worth as I could get to all of them with ease. Believe me, you really don't want to drill out multiple welds while lying on your back. That would make a pesky job like this feel like torture. But when I wanted to separate the front from the rest of the car, that same rotisserie got in the way a little. I would have to make something to support the car from the firewall when I would remove the front with the forward stand of the rotisserie. Because I made sure the rest of the body will keep level and at the same height, the donor front, mounted to the front rotisserie stand, should slide right in. 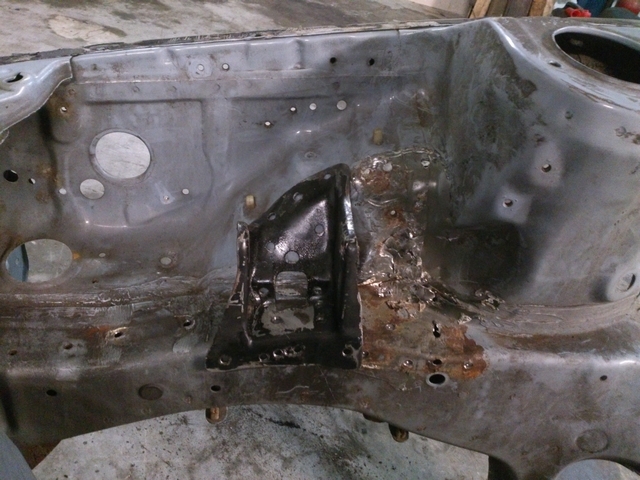 With all that secured, I could start drilling the last welds that were keeping the front secured to the car. I removed the front rotisserie stand to gain a little leverage. But it wouldn't budge yet. 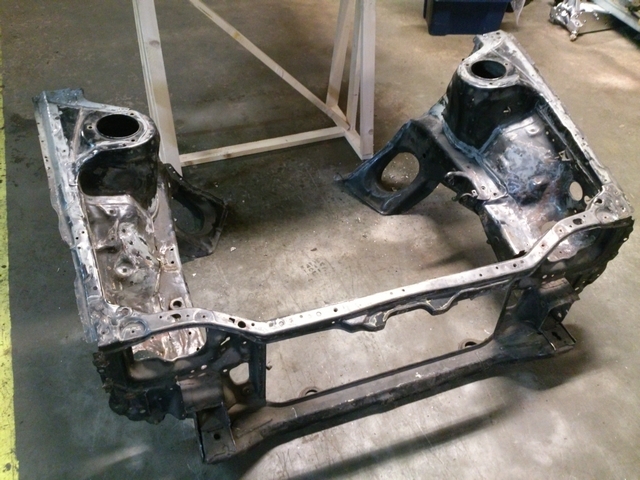 It would take quite a lot of force before the last pieces that remained of the welds would give up. With a nice bang, that finally gave way and the old front fell to the ground. Finally! Result! 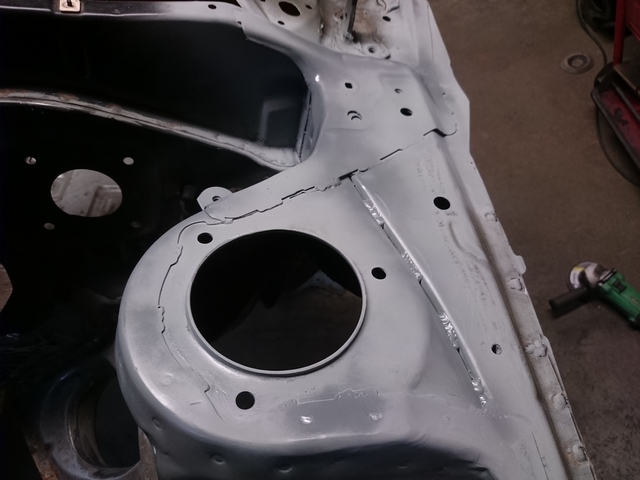 While removing the old front, the firewall sustained a little damage as some of the welds ripped apart a little steel and a few little dent here and there. So before I could weld on the new front I would have to take care of that first. 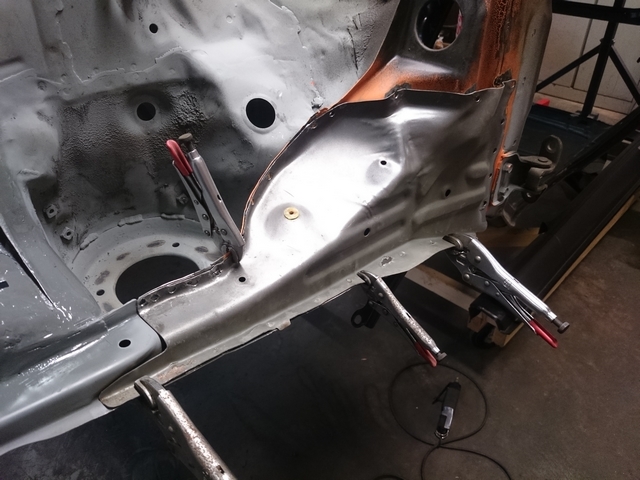 But before I did any of that, I just couldn't resist the urge to mount the donor front to the front rotisserie stand and see how the new front would fit the car. The donor front in position. 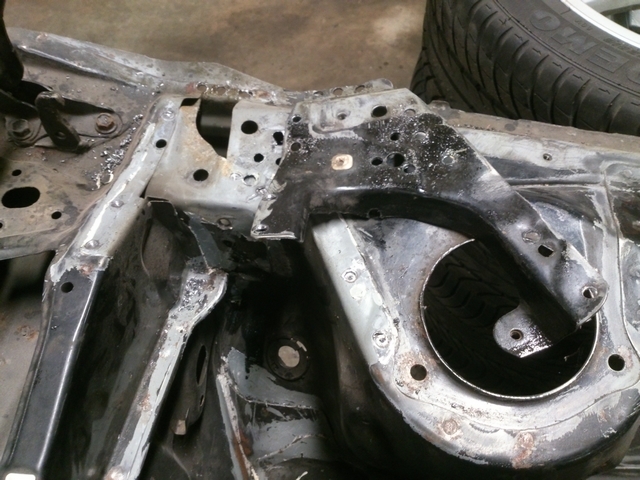 You can also see the subframe and strut tower brace that add a little rigidity to the thing. I can also use these as a reference with the bolt holes in the body to position the new front. Some heavy welding will have to be done now. I didn't have my own welder yet. I rented one in the past, but didn't really have very good experiences with that. And having my own welder would greatly increase my possibilities in what I could do with the car and other things in the future. You just can't have enough tools now can you? So I searched for a nice, afordable, 230 Volt used machine on the internet and found what I was looking for. Now, I must explain that I am not a welder. I have never learned how to weld anywhere. I've fooled around with welders before and can make some metal stick together, but this had to be structurally sound. 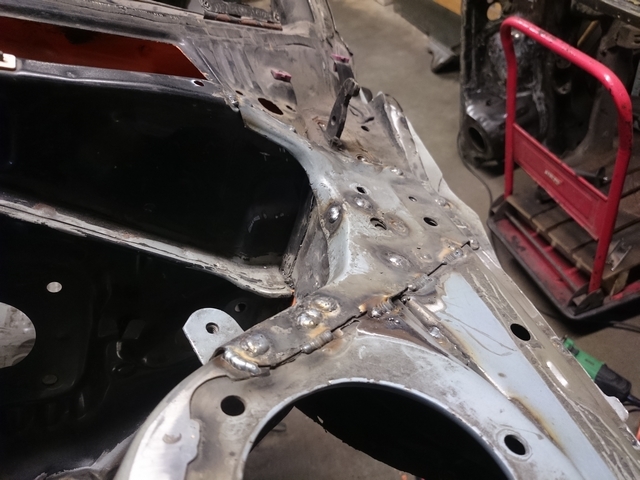 Luckily I know some people who do know how to weld (One of them is a welding instructor no less) and he showed me how to operate my new machine and what the best way was to weld on the thin metal of the car. I practiced a bit on some scrap metal to improve my skills a bit before I went at it and my weld were getting better and better. It was really fun to do too! That same welding instructor friend helped me out in the beginning with repairing and cleaning up the firewall. 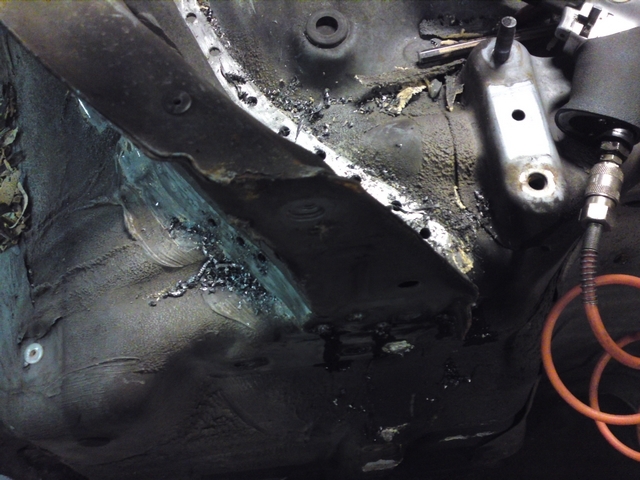 The damage to the firewall wasn't that severe and was fixed pretty quickly. 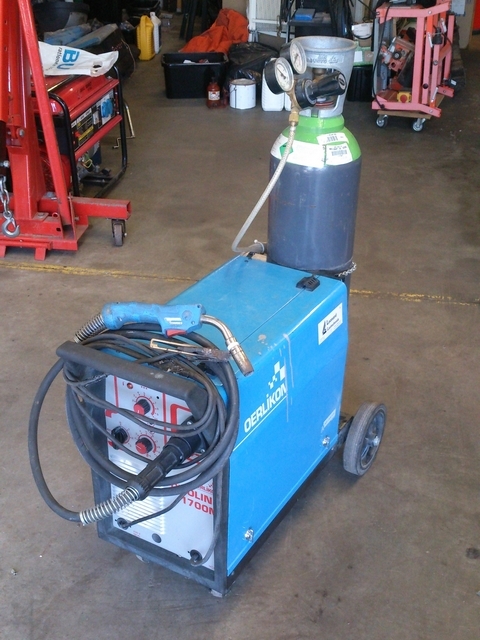 But now that I have my own welding machine, the sky is pretty much the limit. So I decided to give my car a little upgrade while I was at it. Because large sections of the panels are not fused together, when those area's are stressed, they can easily flex. 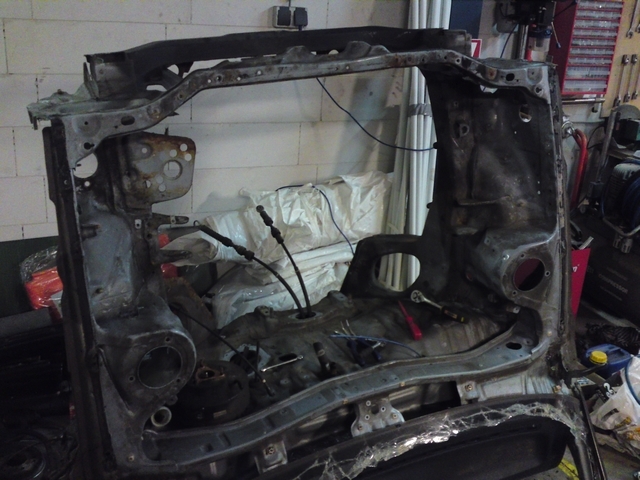 A car with all the panel seams completely welded would be way more rigid. But Toyota designed the car with spot-welds and flex in mind. So the construction of the rest of the body is designed with that in mind. If I were to eliminate the flex points at the seams, the stress put on the metal will just seek out the next weakest point in the panels. They may well buckle or tear as a result of that. So as long as the manufacturer had flex in mind for the body, it's best to allow it to do so to some degree. The first few stitch welds. When the firewall was ready to accept the donor front I could start mocking it up. Placing the new front was pretty straight forward. 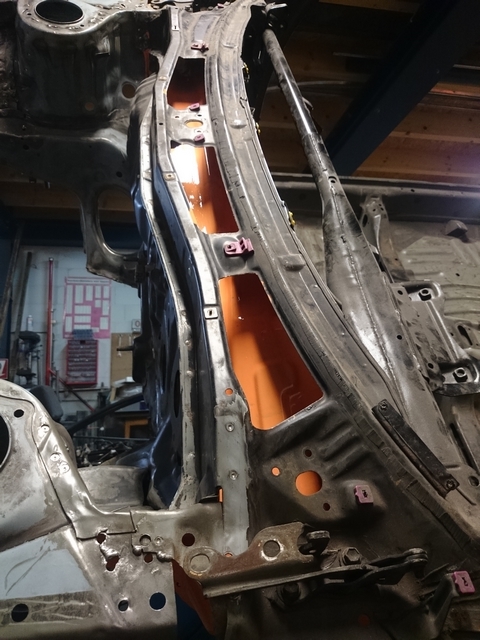 Just roll up the new front to the firewall and bolt the strut tower brace and subframe to the rest of the body to keep everything in place. 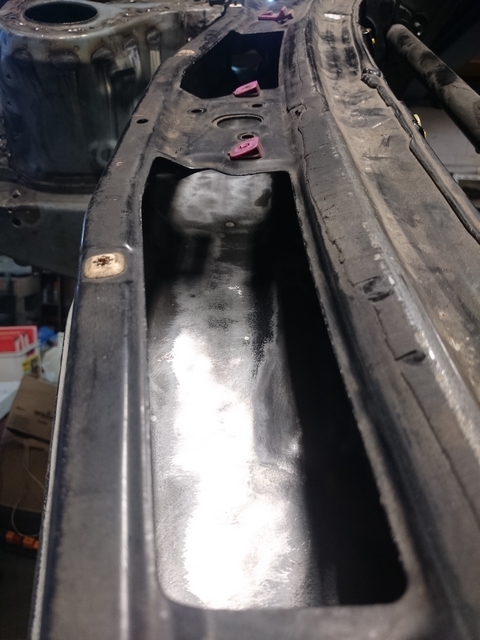 When it was bolted up and wasn't going anywhere I started to measure up the entire front to make absolutely sure it was in the right position and everything was where it was supposed to be in relation to each other. With a little jack and some clamps I could still make slight adjustments to the position of the donor front. When I was convinced it was in the right position I bolted it all down firmly and measured it up again...for about three times. And then checked those measurements again to be 100% sure it was all ok. I wanted this to be right the first time as I was pretty fed up with drilling out welds again. Then I tacked it in place and measured again. 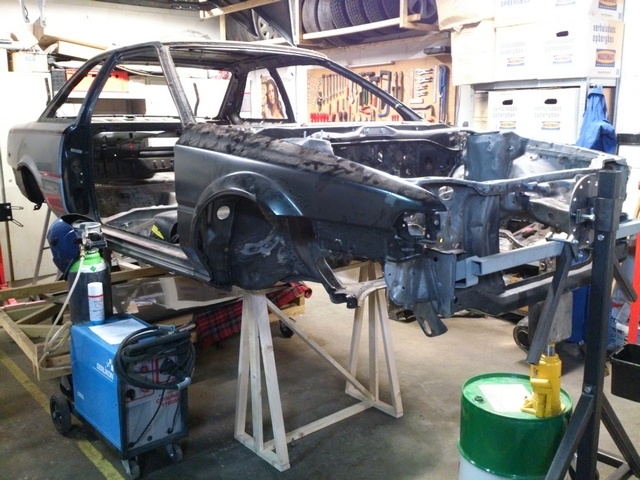 Still all was well, so now I could start to lay some good welds en make the car whole again. 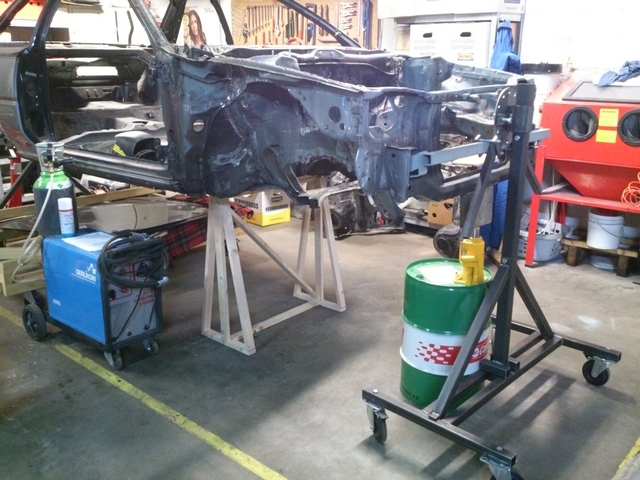 In the picture above, you can still see the little jack I used to line up the donor front to the rest of the car. Measuring it all up is one thing, but it's still just a couple of dimensions. 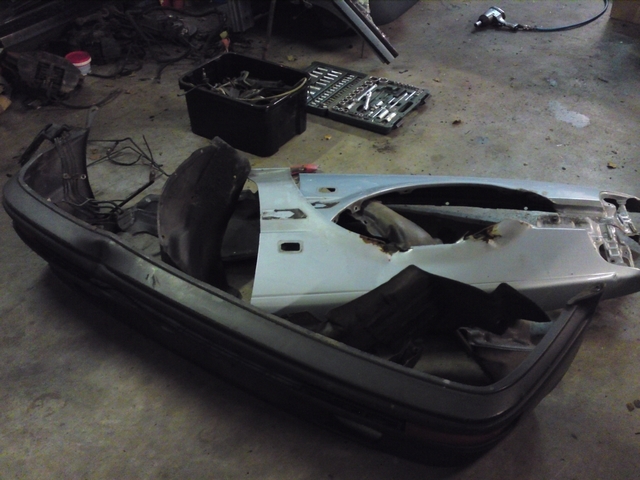 At the start of this whole operation we learned how the slightest deviance could mess with the body panels. So a good way to make sure everything is straight and in position would be to bolt a few panels to the car the see how they would line up. 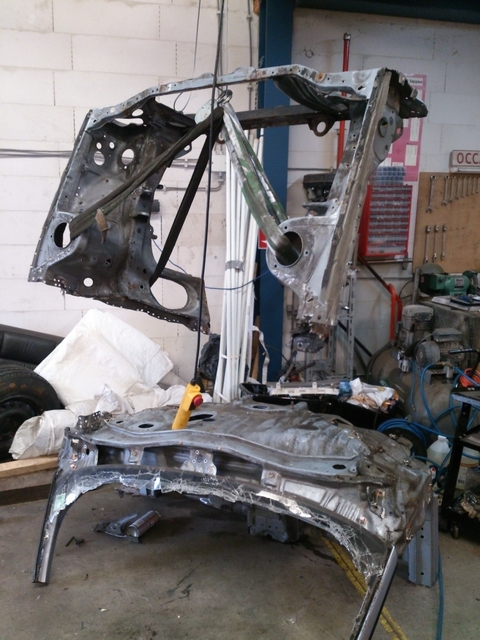 The front fenders are bolted to both the front chassis and the body beyond the firewall. So if the holes of the fenders would all line up, that would be a pretty good indication that all is well. And I was very pleased when that turned out to be the case. Now I could weld everything together to make it one solid chassis again. 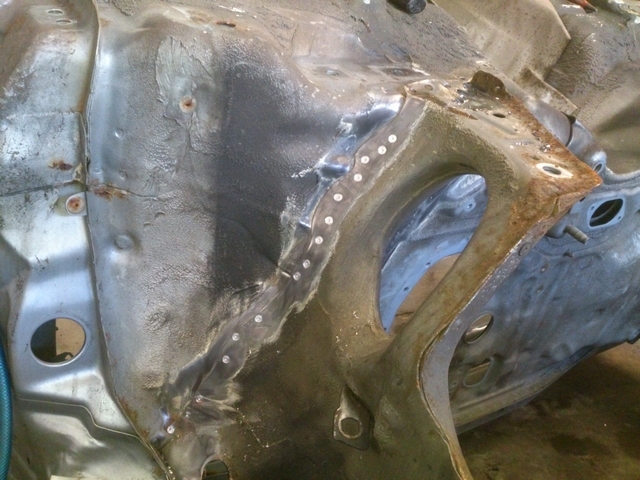 I first plug welded all the spot-welds I drilled out before. 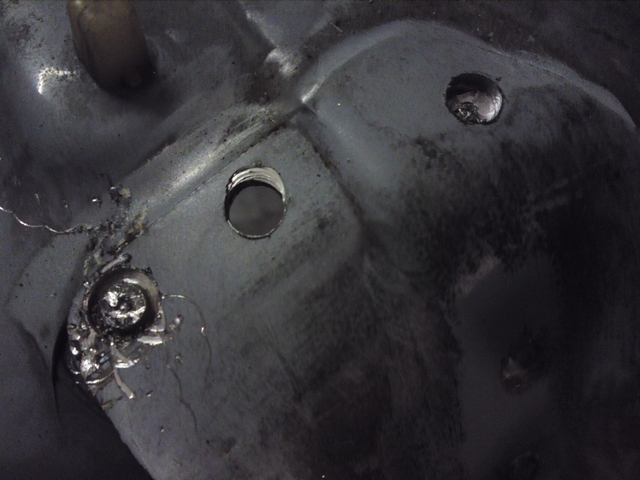 You just weld the hole of the drill shut to the underlying panel, thus kind of restoring the weld you drilled out before. 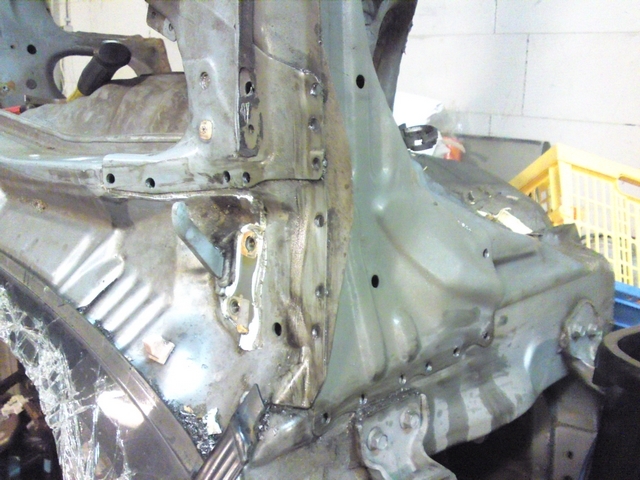 At first there were some pretty big gaping gaps between the front panels and the firewall. While wiggling the front off during the separation, the metal was distorted a little. The steel used in these sections is HSS steel (High Strength Steel) which is pretty tough and doesn't fold back easily by just whacking it with a hammer. 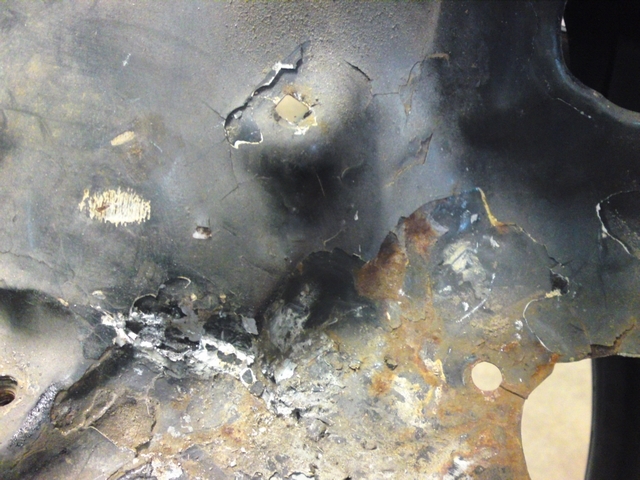 But when you weld the steel, the heat makes the steel surrounding the weld a whole lot more pliable and was easy to hammer back down into place. 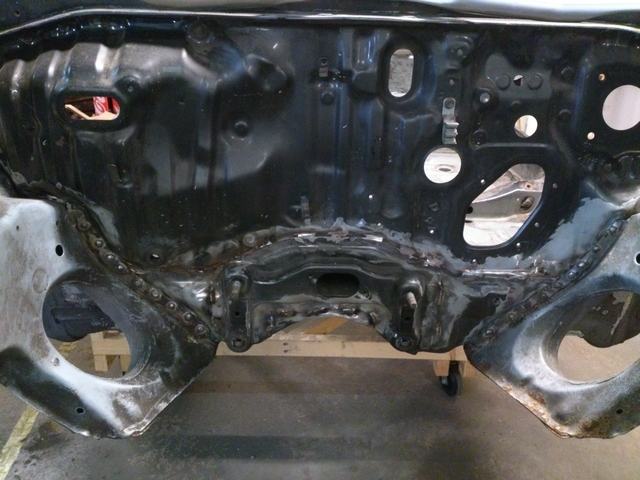 So piece by piece and weld by weld, I was able to get rid of all the gaps and make all the panels flush again. 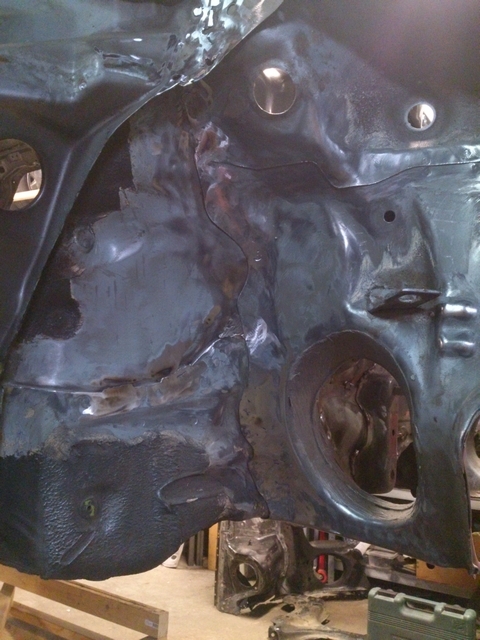 Welding the donor front on went a whole lot quicker then removing it. 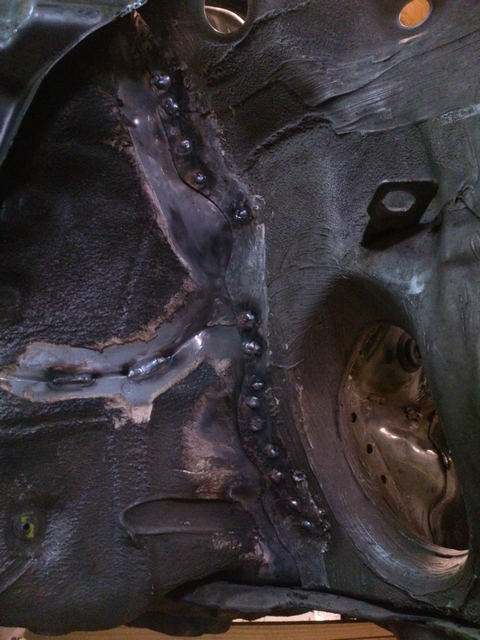 So all the plug welds were done before I knew it and the donor front was as sturdy as Toyota once meant it to be. 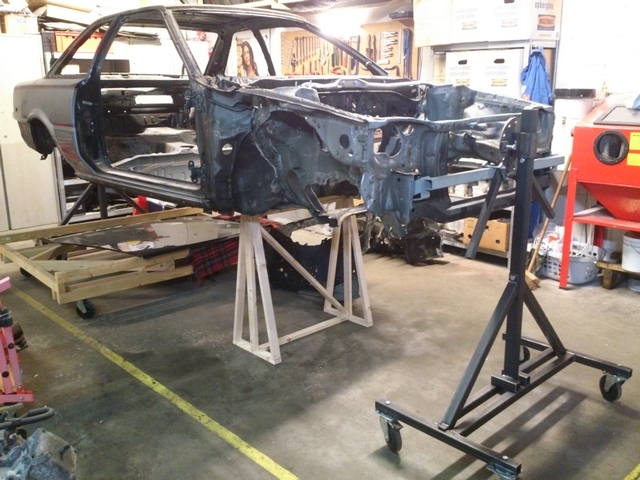 This also meant that I should be able to remove the little jig I made to support the body and that the full weight of the car was going to hang on the donor front again. 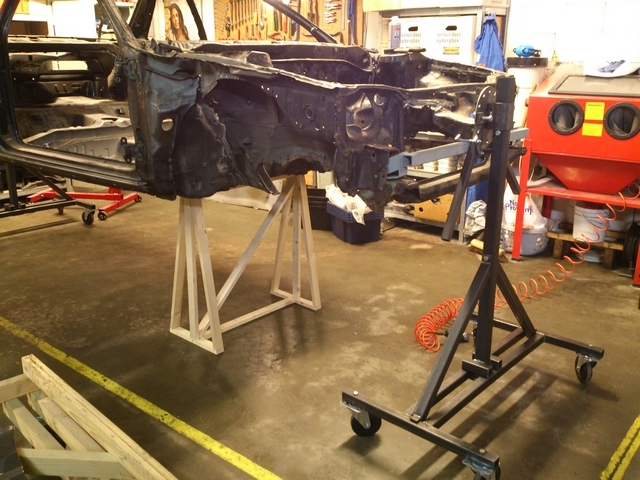 I would also be able to rotate the body with the rotisserie again which would make welding on the underside of the car that much easier. Now that all the plug welds were done, I had to clean them up a bit. As they were now, it was like the car was full of dimples. They would have to be grind down to make them flush with the rest of the metal so that they would become invisible. 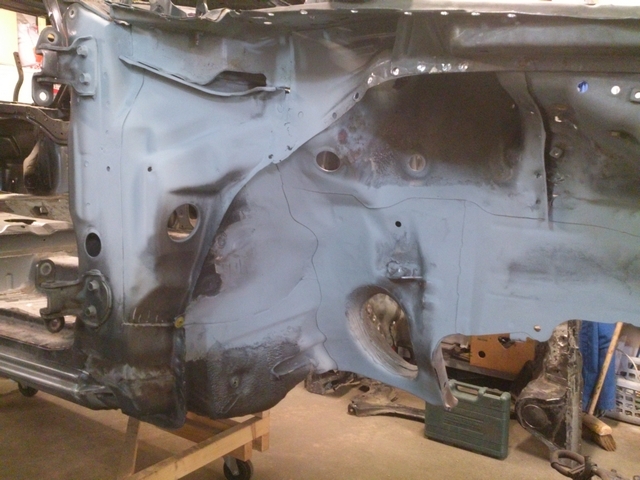 I also had to coat the bare metal with something to prevent it all from rusting away. I used zinc spray for this with a zinc content of 90%. That should do the trick for now. 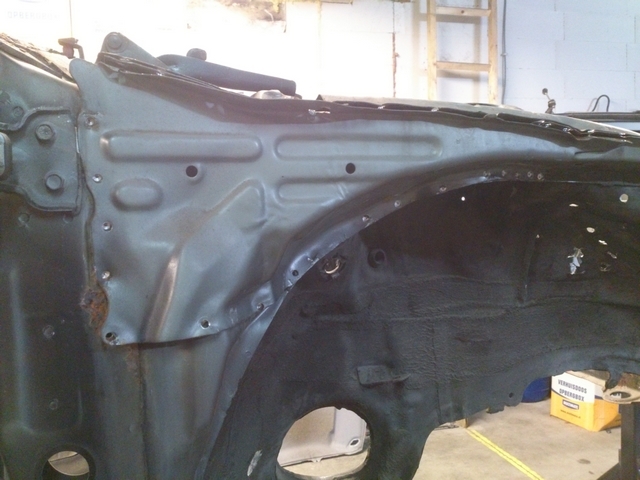 If you didn't know, you probably won't be able to tell this front came from a completely different car! 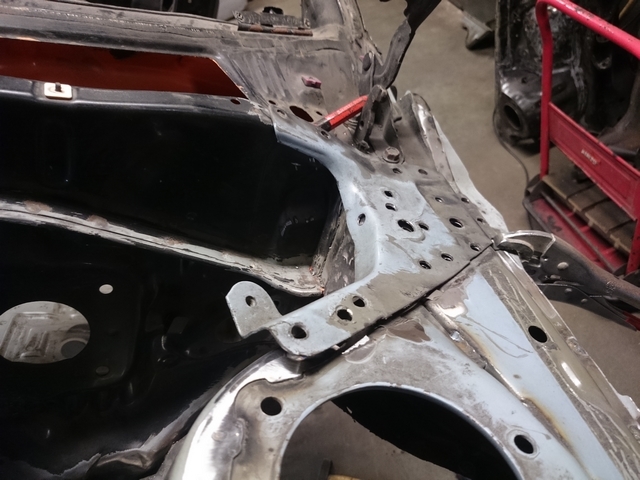 When all the panels are welded back into place, some parts of the body that are now accessible aren't anymore. Some of the drains channels for the gutter under the windscreen cowling are behind those panels. A lot of water goes down that channel so I thought it might be wise to remove any rust that is already there and give it an extra rust preventing coating. With various wire brushes I was able to get into almost every nook and cranny of the windshield gutter to get rid of any rust. Directly after, I coated it with some good old fashioned lead loaded paint. Not only in the gutter itself, but also along the sides where the water drains down. I can't get to those parts anymore when the last panels are welded back in place, but now they should be well preserved for years to come. 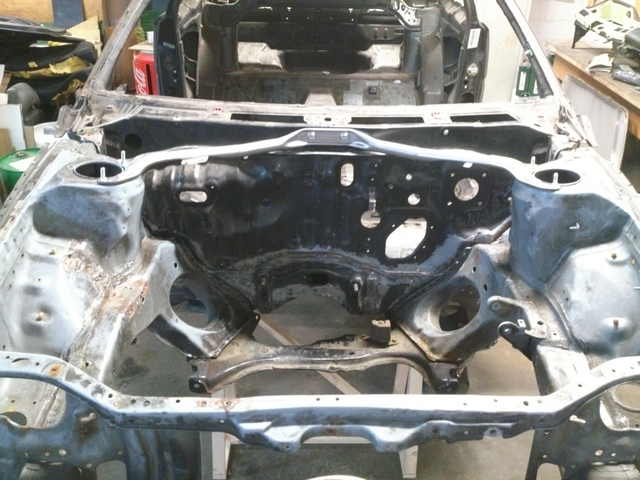 When this was all done, the body was ready to get the last panels welded back in. 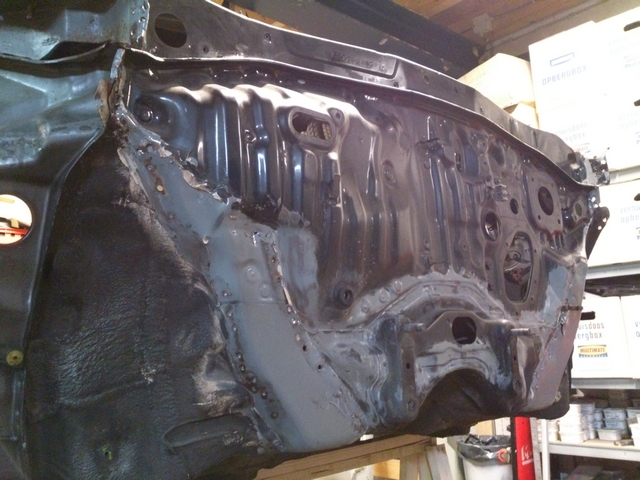 With one of the last panels, I photographed the entire process of welding it back into place. This way, you guys can see step by step how I did this. As can be seen in the pictures above, when you first try to place the panel, the gaps are still pretty big. But if you hammer the panel down bit by bit while plug welding, you can get it back flush again. In the pictures above, I already laid down the stitch welds along the panel seam as well. 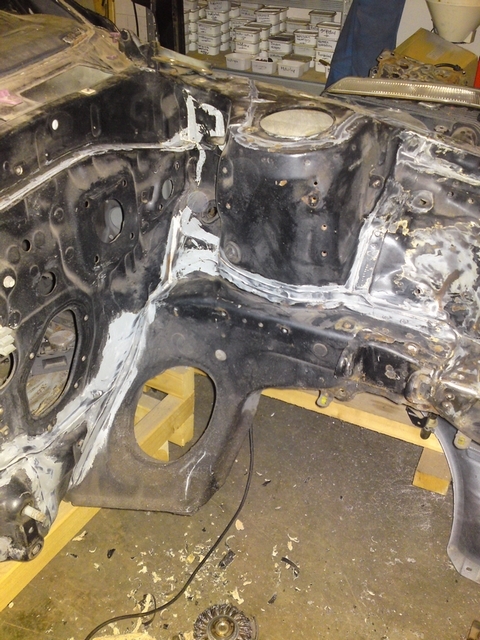 The welds are grind back down again and the whole thing is coated in a protective layer of zinc spray. And the rest of the front will also receive the stitch welds in the panel seams. And when all the last panels are welded back into place, it's time for the big moment. The ultimate test to see if all this work would really pay off: Getting all the body panels back on the car to see if they will fit this time around. 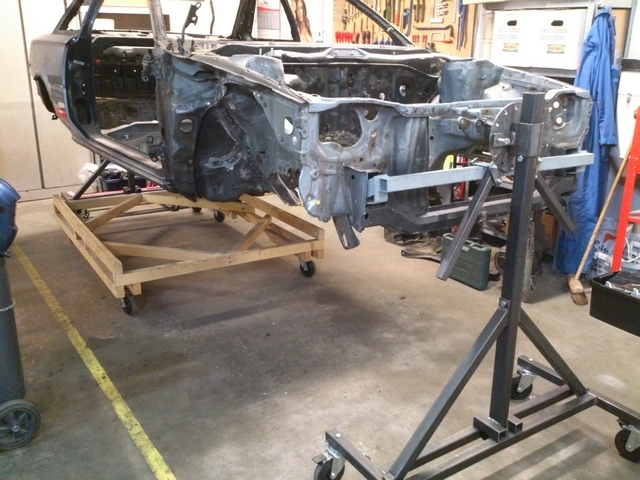 So I removed the front rotisserie stand to be able to get the bumper back on and rest the car on some new adjustable stands I made at work and got all the panels back down from storage. I guess I pulled it off. 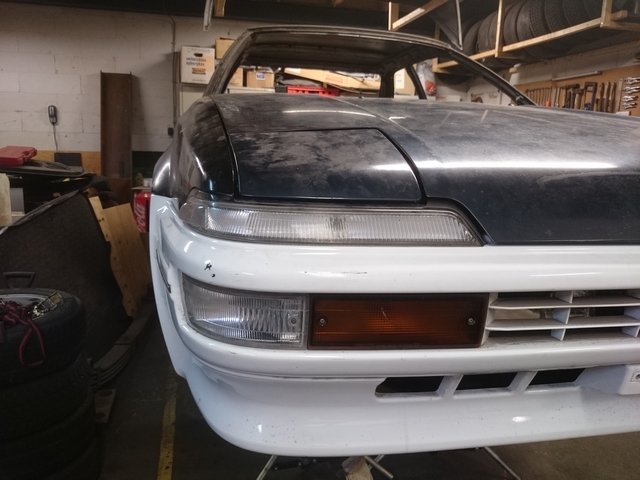 All the bolt holes lined up with the chassis and all the new parts like the Trueno Zenki bumper, pop-up headlights, hood and front fenders (non of which came from the original car!) all lined up very well! Not all the gaps were perfect yet, the panels were only partially bolted down just to fit. But they can be fitted perfect now after some adjustments. Something that wouldn't have been possible with the old front still in place. 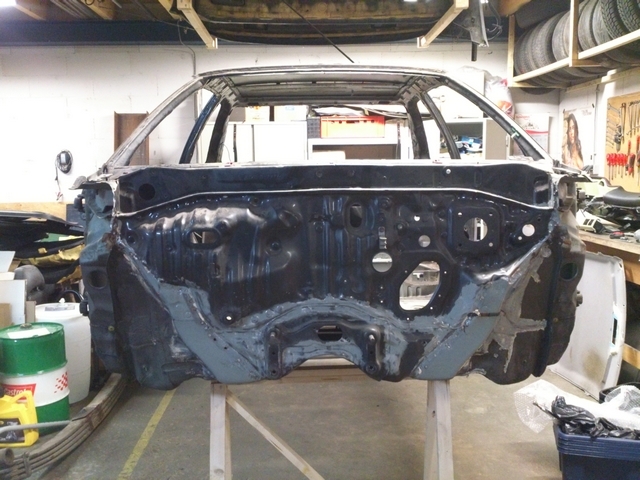 For the very first time, the parts were coming together and the new look of the front of the car could be seen. I don't know what you guys think, but I like it!